The Acculamp® economy grade series includes the BR20, BR30, and the BR40. The lamps are rated to deliver an expected service life of more than 45 years based on the average use of three hours per day for 365 consecutive days. The lamps are designed to replace 50-, 75-, and 100-watt (W) lamps while using 8, 12, and 17 W, respectively. 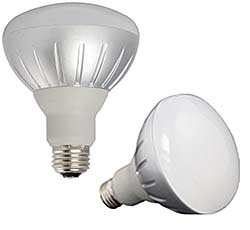 The lamps are available in lumen packages of 500, 850 and 1,045 and are dimmable down to 10 percent.